We are always open to holding game nights with specific themes – contact us! We are planning more events, such as for classic card games (Bridge, Pinochle, Hearts), other tournament games (Epic, Catan), and more intro-to-gaming events. Bookmark this page and check back frequently! Every year, we have the opportunity to use our love of board games to help support children in treatment at the Bernard & Millie Duker Children’s Hospital at Albany Medical Center. Join us for just a few hours, or for the full 24 hours. All the gaming fees will be donated to the Bernard & Millie Duker Children’s Hospital at Albany Medical Center, and local businesses have donated items for the raffle! Our full menu will be available for purchase, so you can spend your time focused on the games. Craft Beer will be offering some great beers just for the event, with proceeds being donated. Use our library, or bring your own game and gather a group. We have some specific events in the works, including game demos, RPGs, and more! 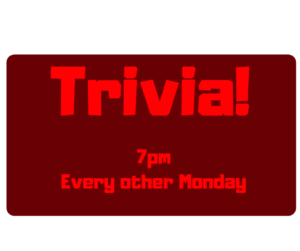 Every other week, on Mondays, Amalie Remsen will be hosting TRIVIA. Each one will have its own theme, announced in advance, and prizes will be given out to the winners! We’re bringing back our Monday craft nights! 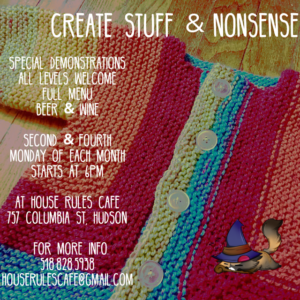 On the second and third Mondays of each month at 6pm (alternating weeks with trivia), join a group at House Rules Cafe to “Create Stuff and Nonsense.” All crafts (and arts) are welcome and encouraged! Bring whatever project you’re currently working on – knitting, weaving, beading, painting, sketching, anything! – or come to learn something new! All levels are welcome. We’ll have special demonstrations (TBA), and our full menu will be available (including beer and wine).